Happy Labor Day, everyone! I hope you’ve been able to relax, stay cool, and enjoy this long weekend! I’m doing my best to stay inside due to the fact that every time I step outside, it makes me feel like an extra 10 pounds is weighing on me. The Midwest is great, but its humidity is not my friend. At least this weather is making me that much more eager for the leaves to start changing and for sweatshirts to begin making an appearance. 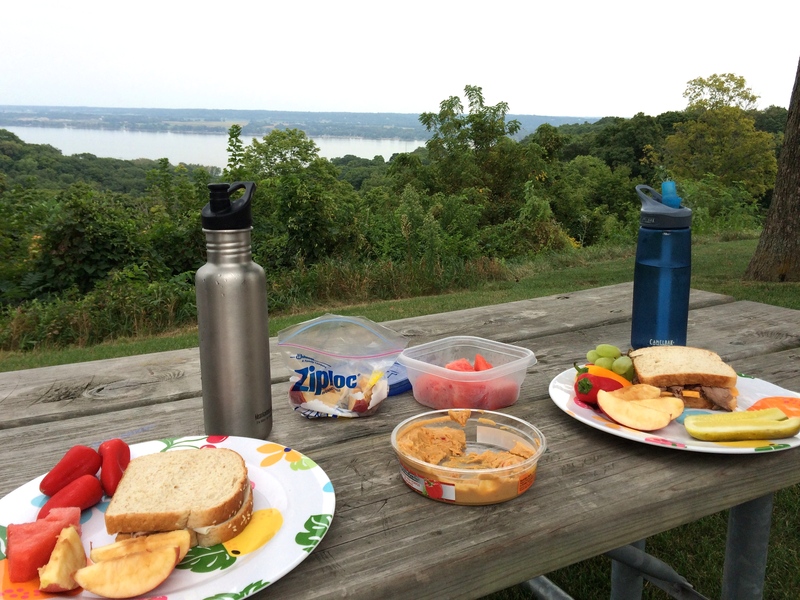 We made a trip back to Grandview Drive this past Saturday to enjoy another picnic together. While the picnic didn’t last 6 hours like the last one (re: it was really hot out), it was still just as special and fun to try to remember what exactly we talked about during our first picnic together. Back in Madison, I’m soaking in the last hours of my long weekend, as I’m sure most of you are. With school just having started this past week, I’m guessing parents are taking a deep breath this weekend before the real craziness of fall activities begin. Recently, I wrote an article for a local paper and thought it’d be worth sharing part of it on my blog for all the families (big or small) who are already wondering how they’re going to get everything done this school year…including family meals. Enjoy! I grew up in a family where we were constantly on the go. I’m sure most of you can relate. From band practice and speech contests to sporting events and practices, we never had much time to relax together as a family. The one exception was meal time. When we got home, my mom or dad almost always would have a meal prepared for us, and together we’d enjoy it as a family. While I didn’t appreciate it nearly enough at the time, I now realize how beneficial this was for both helping my family bond and giving us the nutrients and energy we needed to keep going from one activity to the next. Today’s fast-paced lifestyles make it easy to let eating together go by the wayside. But now that the kids are back in school and we’re scrambling to get back on track with schedules and routines, it’s a good time to make family meals a priority. The reasons to enjoy family meals at home are abundant and well researched. They have been shown to help improve your child’s nutrition, reduce the risk of childhood obesity and encourage healthy eating habits, and they also are good for the spirit and mind. Regular family meals improve self-esteem and academics and reduce risky behavior. Talk about a win-win! This is easier said than done for most families, so I suggest starting small. My challenge to you, for National Family Meals Month, is to start with one more meal a week at home together as a family. It doesn’t have to be elaborate or 100 percent homemade. A family meal doesn’t have to be at dinner time either. Keep it simple and appreciate the fact that your family is together around the table – if only for 10 minutes in between activities. Look at everybody’s schedules and plan what meal or meals you want to share together as a family at home and how much time you’ll have to prepare it. If you know time will be short, go the semi-homemade route. For example, buy a rotisserie chicken on your way home from work to make chicken tacos or burritos. It saves time, but still allows you to enjoy time together as a family. If your family isn’t home until 7 p.m., but you normally eat at 5, it’s okay to eat later. Have a snack for yourself and whomever is home so you can wait until everybody else shows up. Every night doesn’t have to go “by the book.” Do what’s best for you and your family. Creating a family meal time can be downright stressful, so find ways to make it fun and reconnect with your family so you can reduce the stress around meal time. Come up with a menu theme for the week like “Mexican Week,” have a “hands-only” dinner where no silverware is allowed at the table; perhaps come up with a friendly cooking challenge to see who the better family chef is or pretend your dining room is a restaurant, with your kids as the waiters or waitresses. You don’t have to be the sole person responsible for getting food on the table every night. Turn this into a great opportunity to get your kids involved in meal preparation. Cooking is a valuable experience that introduces kids to nutrition and healthy eating habits. Kids of all ages can start participating. For instance, a 3-year-old can help wash fruits and vegetables, a 5-year-old can set the table, and 9-year-olds are ready to start helping make simple recipes. The more your kids are involved in shopping and meal prep, the more likely they are to try new foods – creating a more enjoyable eating experience for the whole family. Posted in Dietitian News, Home, Marriage, Nutrition on September 7, 2015 by Kara Hoerr.